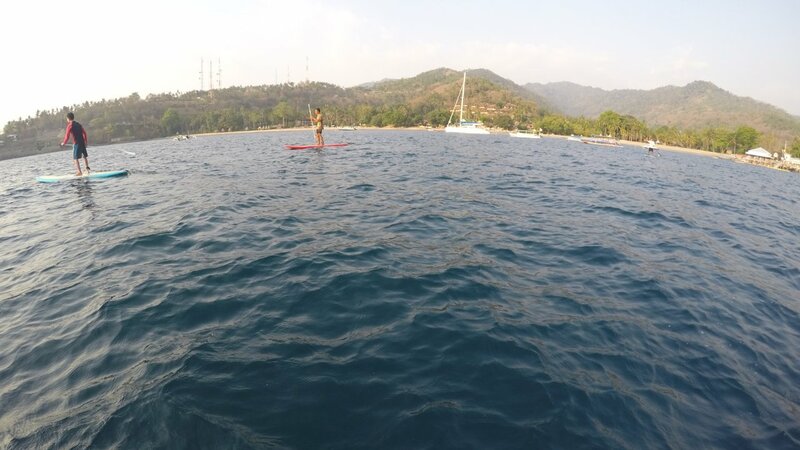 Adventure Lombok Tour are the first Paddle Board school and rental in Senggigi, was crated in 2014. We offer a full range of Stand Up Paddle activities – SUP Rental – SUP Lesson for Beginners – SUP Tour Package. In set of 2 – 3 hours lesson, our introductory programme allows a total novice to master the basic SUP skills and quickly and easily. Learn the essentials in simple, easy to follow steps and master the art of board handling – Basic safety, weather condition to be aware of – Stop turns and spin turns – Paddling and balancing technique using your paddle – Correct body posture and paddling technique – How to use paddle to stay on the board, all do in fun and easy going. The SUP day trip program is designed for those who has experienced using Paddle board in advanced. The tour will accompany by an experienced SUP guide who mastered the technique and the area to go through. We begin the program upon picking you up from your hotel at 08:00 and drive you to Senggigi beach area which is the most proper place to start your experience to explore the beauty shoreline along with paddling your board. Stretching and warming up your body is suggested before paddling, Then off you go…you will paddling along the beauty coasts of the north starting from Senggigi bay, Kerandangan, Malimbu up to Nipah bay as your last destination to go. Along the tour you will also be escorted by a boat for safety reason and to assure you in good condition. The tour will takes approximately 1.5 hours paddling and can be book two days before. • Please wear a light wet suit to prevent the sun burn and flexibility movement. The SUP Lesson will introduce you how to experience and exploring the ocean by SUP board. For some people in previous time they might enjoy their vacation to explore the ocean by sit on kayaking board activity, but to seek a new advantage regarding to beach activity, people start to develop a new way exploring the ocean in not a boring way. SUP will let you more freely to ride the board in flexible move, especially for long distance paddle activity that will let you to stand or sit on the board while paddling. With that opportunity we also take an advantage to create and teach the SUP courses for those who have interest exploring the ocean in a new way with SUP board, and as another opportunity our company is the one and the only company who run this SUP program from SUP board rental, SUP board tours and SUP courses in Senggigi perhaps in Lombok from beginner course to advanced level. The SUP Course will spend about 3 hours, which is 30 to 45 minutes lesson and the rest of the time you will be accompany by the instructor to go along with you to the best place to practice and explore the ocean by your SUP board. Once you mastered the course you are welcome to paddle on your own way and take more time to practice that will bring you more confidence to be one step up to take an advance course level.